Mark your calendars: “Breakfast Meeting Featuring Congressman DeFazio” on May 9. 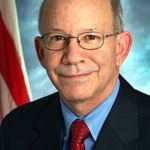 Chairman Peter DeFazio of the House Transportation & Infrastructure Committee will speak to the Propeller Club of DC at our first major event of 2019. This event will be open to members and non-members. All payments must be received in advance via RSVP link. In compliance with widely attended gathering rules, we anticipate attendance from large number of people from the maritime industry representing a diversity of interests.